Eric Davis played college ball for Jacksonville State. 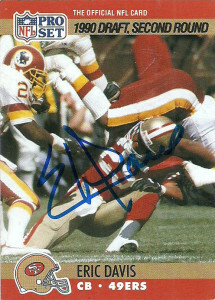 He was drafted in the second round by the San Fransisco 49ers in 1990. At 5’11”, 185, Davis was considered undersized for the cornerback position, but quickly found himself chomping at the bit for a starting role. 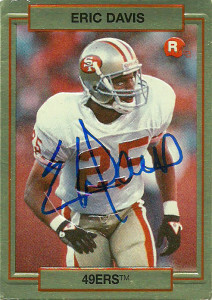 Underrated, Davis was overshadowed by the bigger names in the 49ers secondary, that needed to be rebuilt after the departure of Ronnie Lott. Tim McDonald, Deion Sanders, and Merton Hanks all had impressive seasons in 1994, but it was Eric Davis that propelled the team to their Super Bowl win with his impressive playoff run- a season in which he had an NFL record interception in 5 straight playoff contests (spanning 93/94). He’d have his best year in 1995, a year in which he won Pro Bowl and All Pro Honors. For 1996, the 49ers made Eric Davis a free agent. Eric signed with the young Carolina Panthers team. He’d play for the Panthers for 5 years. During that run, Eric had 5 interceptions in each season. He played for the Broncos in 2001, and then moved to free safety for the 2002 season for the Detroit Lions. Davis transitioned to the booth and into media seamlessly. He’s done color commentary for preseason games, and worked on early morning AM sports TV and radio shows. Action Packed 1990 was one of my favorite sets of that era. Everyday after school my mom used to stop at 7-11, and I’d get a $2.25 pack- a stiff price to pay at the time. I slowly bought a whole box out of the convienience store, only to find that the only card I hadn’t received was this Eric Davis card. I wrote Hi-Pro Marketing, (the company behind AP at the time) and they responded in a few weeks, enclosing 2 copies of Eric Davis and including a cool prototype/ test card of Barry Sanders from their 1992 set.